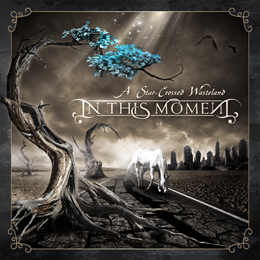 In This Moment is an Californian metal band from Los angeles. The band was formed by vocalist Maria Brink and guitarist Chris Howorth in 2005. Drummer Jeff Fabb joined the collaboration and they started a band under the name Dying Star. But unfortunately they had problems with maintaining a steady line up. Unhappy with their musical direction, they changed their name to In This Moment and gained two band members, guitarist Blake Bunzel and bassist Josh Newell. In late 2005, bassist Newell left the band and was replaced by Pascual Romero, who in turn was quickly replaced by Jesse Landry. Landry was replaced by Kyle Konkiel in 2009 and Konkiel was replaced by Travis Johnson in 2010. Jeff Fabb and Blake Bunzel left the band in 2011, and were replaced by Tom Hane and Randy Weitzel respectively. So yes they had some trouble along the way, but then again they were up to releasing a fourth studio album last summer so they must be doing alright. The record is called Blood and i must admit it has it's highlights. It has industrial and nu/groove metal influences and somewhat reminds me of lacuna coil in some way. They keep it interesting by throwing a lot of variation to all those songs that do all sound different. The downside for me is that it does sound a bit simplistic, but apart from that this is a fun record to listen to.